Hey folks.. howzitgoing?? It’s been a bit hot the past couple of days and we haven’t had any rain, but today we are getting a much needed soak. What a perfect day to do some art, don’tchyathink? 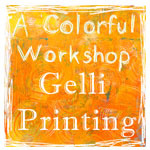 Jessica Sporn asked me to see what I could do with her new rubber stamps from RubberMoon. Thanks, JS. 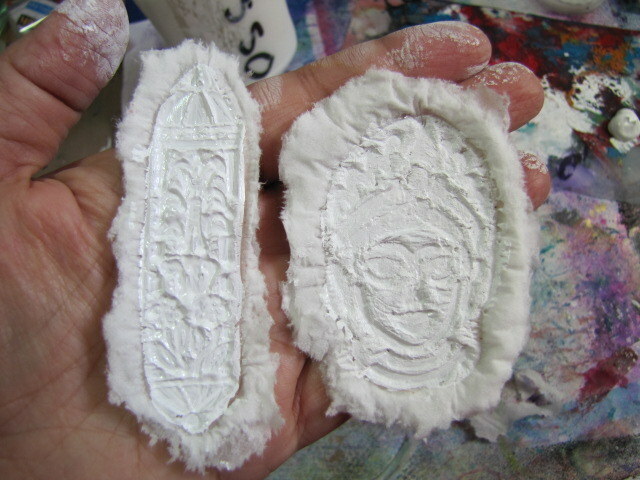 My first thought, was to create something in polymer clay, but then I remembered some fun paper casting I had done a couple of years ago to make some cool embellishments. 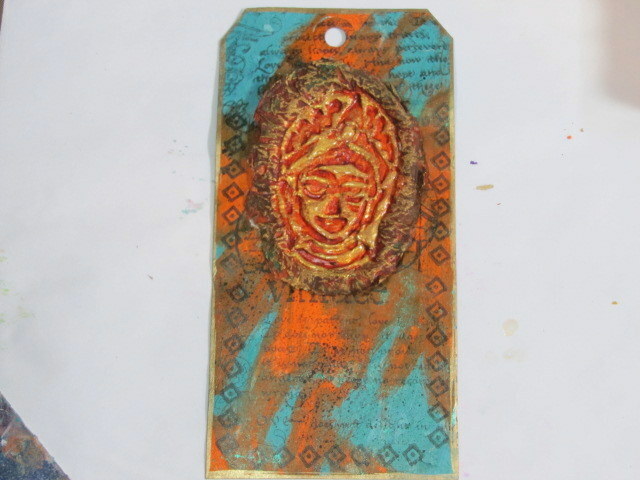 I used two of Jessica’s stamps. 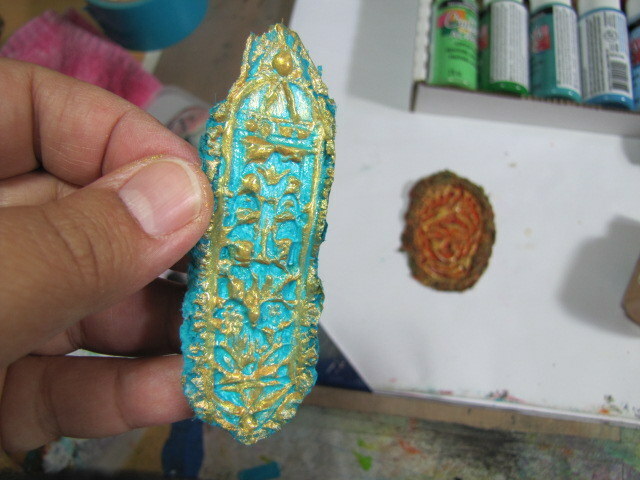 KRISHNA and MEZUZAH; you can see and order them here. 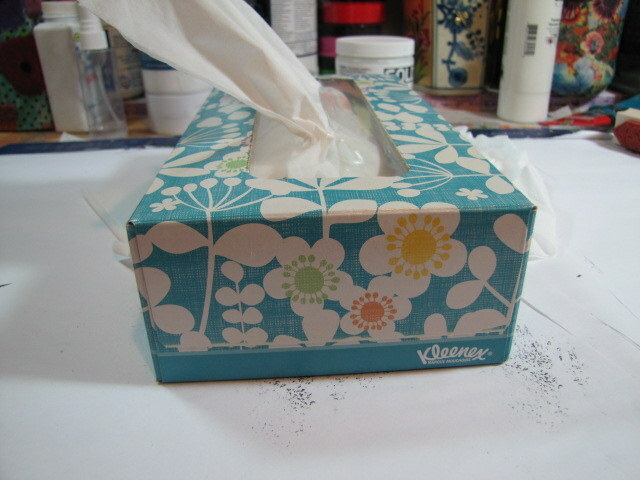 I took 2 Kleenex brand tissues and pulled apart the plys. That gave me 4 layers, but now cut them in 4’s. You want to have a small stack of square tissues. I used about 7 layers for this. 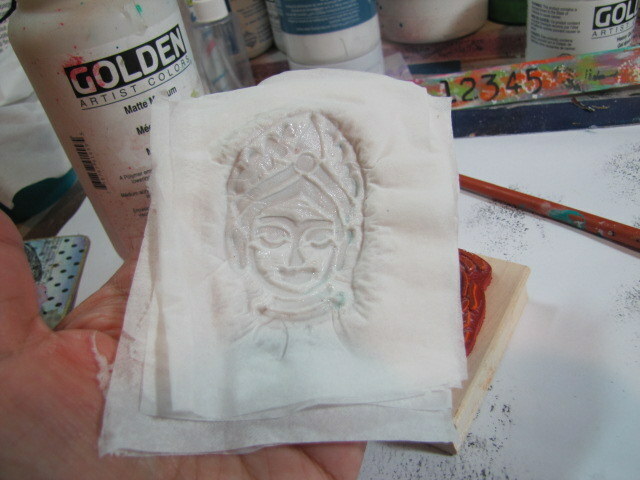 Using matte medium and the rubber stamp facing UP, start to layer one tissue on the stamp and brush the medium over it, covering the design. Keep repeating until you use up the 7 layers. You can try more layers if you want. 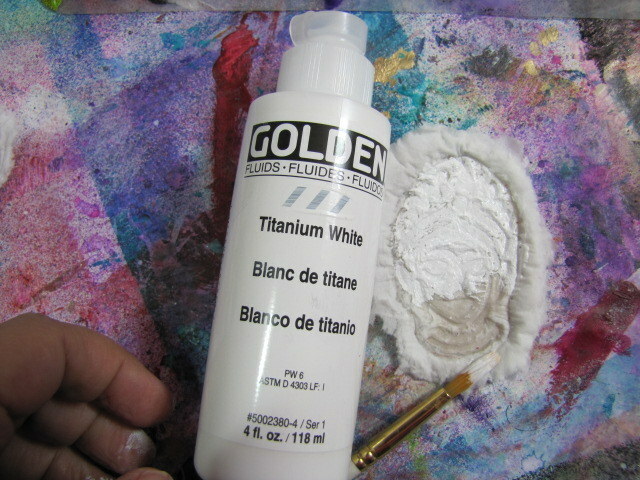 Here, I’m using KRISHNA for my tutorial. 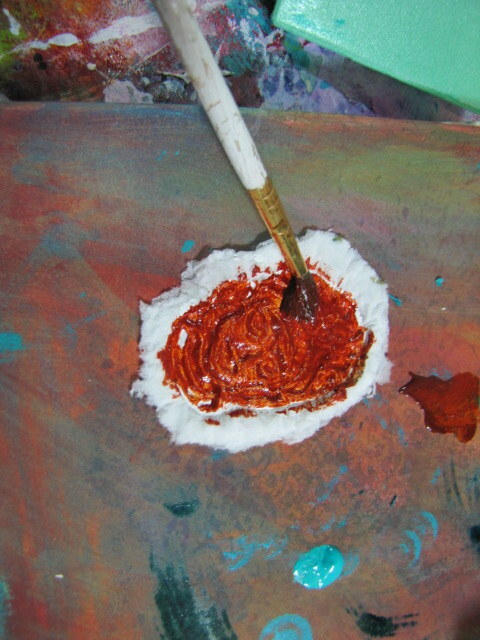 After each brush of the medium, I gently rub my finger of the layer to smooth it out and make sure the design shows it’s details. 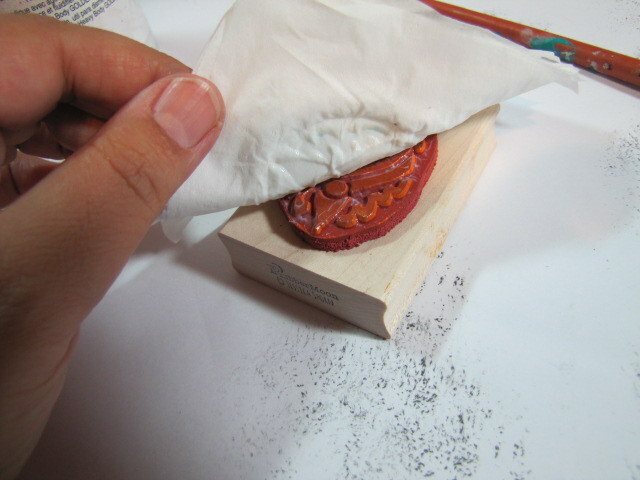 Now, gently lift the layers off of the rubber stamp and you can see the design. 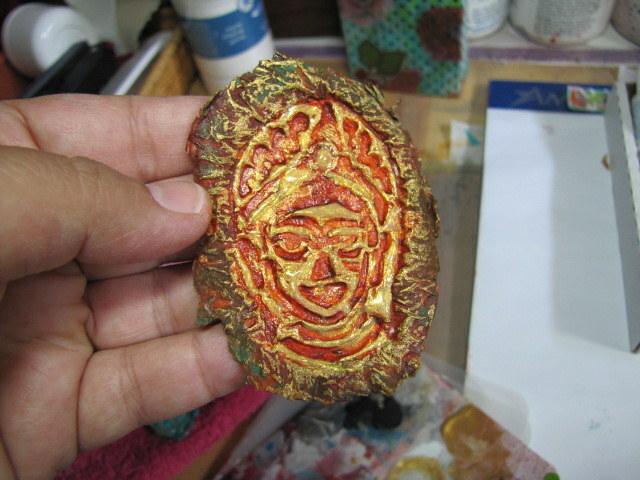 Let this dry for a few hours until hardened.. or even overnight. You can see the two rubber stamps dried below. 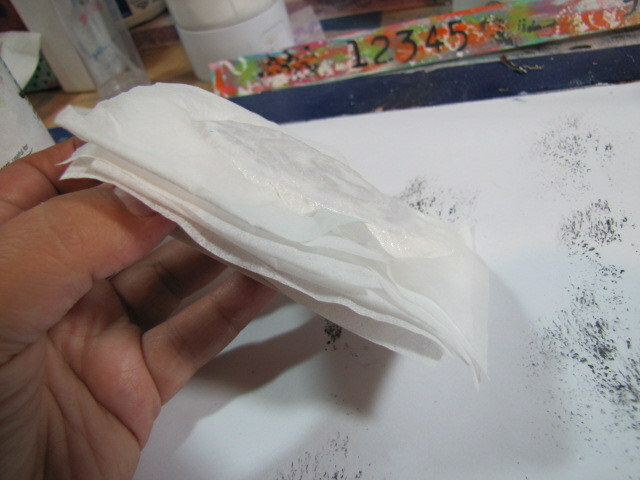 Next I ripped around the edges of the square tissue to round them off. 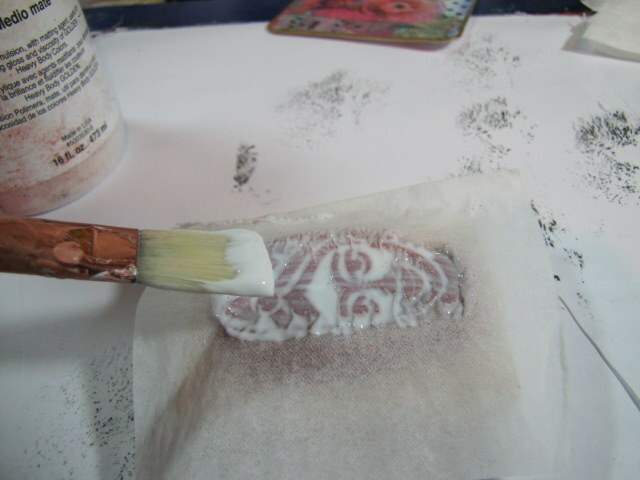 Then I took white acrylic paint and painted the the top of the design. Time to add some color. 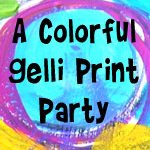 You can use any colors you’d like. 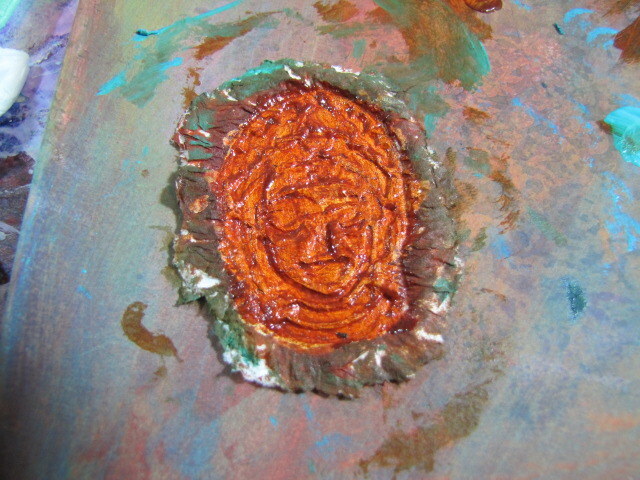 I painted the entire image, let dry. 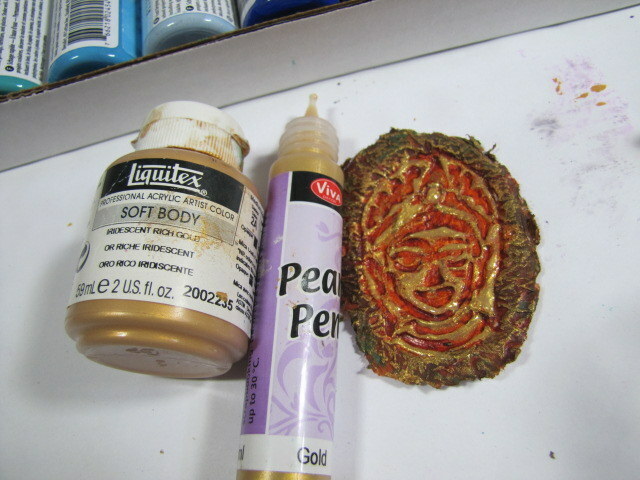 Then I used gold acrylic paint and a pearl pen to just highlight the the parts that were elevated. 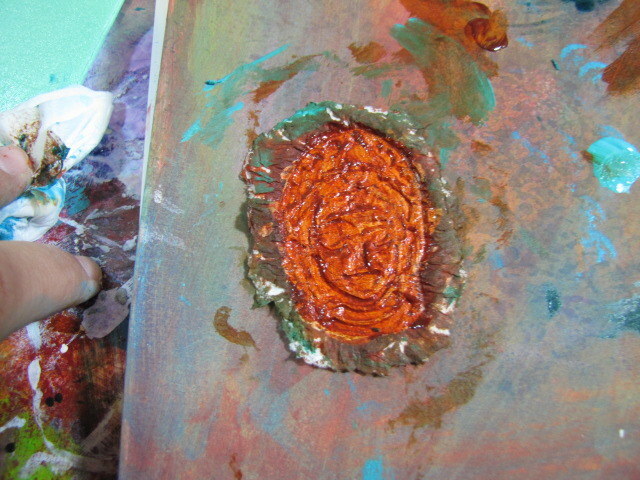 I just mixed them on a palette then used my finger to gently swipe the color. 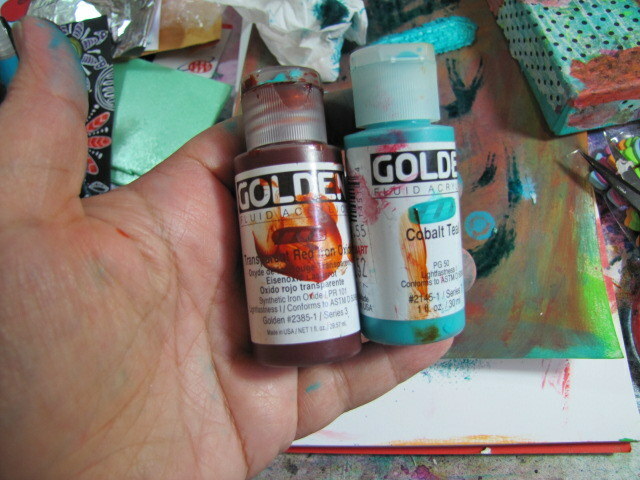 I did the same with the teal paint and gold highlights. 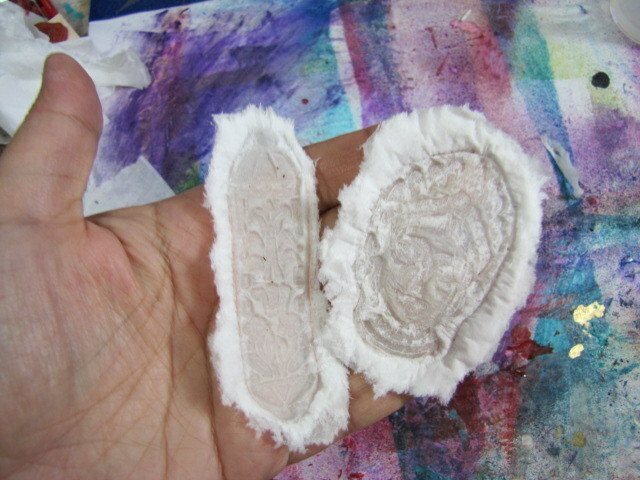 Now they are ready to used as embellishments once they are dry. 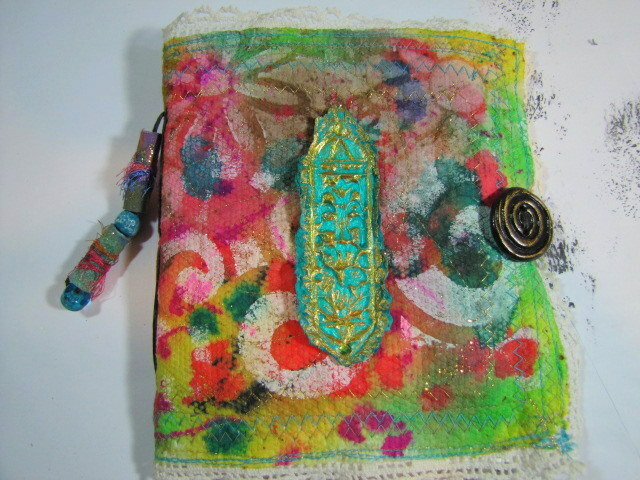 I used Krishna for a tag and the Mezuzah for the top of one of my soft journals I sewed out of paper towels. Really. 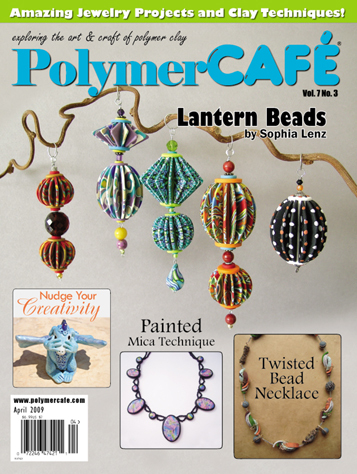 These are easy supplies and I’m sure you have them in the house. 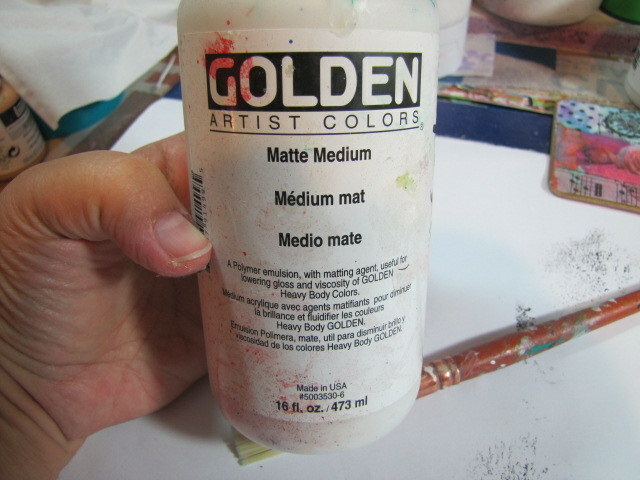 You can used watered down glue instead of medium. I had a lot of fun with this simple technique and what a great excuse to get me back in the studio. Even though it took me 2 months to getter done… right Jessica? 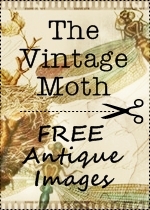 In my last post, I mentioned giveaways. As I said, these supplies are gently used and I want to give them another home. I either already have a duplicates or I no longer use them. Here before you, my lovely peeps, I have a flower stencil, a piece of an orange barrier/temporary fencing, which I use as a stencil. 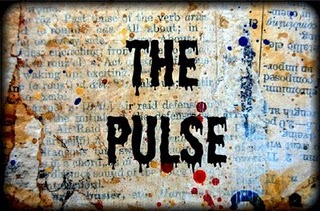 I was given to me by my friend Corrine Gillman. Thanks, CG. 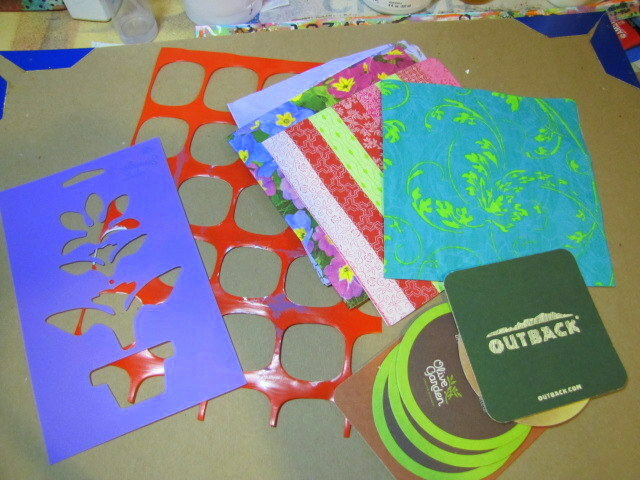 Also coasters from my collection to make art on and some beautiful decorative napkins for collage. Crossing fingers that you win. I’ll pick a winner by next Friday, June 5th. Thanks for visiting, commenting and being fantastic subscribers.